I am usually on the prowl for easy delicious recipes that cater to busy families, which is a trend you’ll notice if you scroll through my posts. That said, this is not an outwardly weeknight “quickie” recipe. However, there are ways to make this dish more weeknight appropriate, which is something I recommend. What I did was make the meatballs and sauce (separately) ahead of time. This way when we were ready for dinner I just fired up the grill, sauced the pre-made meatballs, and enjoyed. If you want to do this just sauce what meatballs you know you will eat, and put the rest in the fridge. I will say that the extra time it took to initially put this dinner together was well worth it. The tangy sweet sauce is the showstopper in this dish which paired really nice with the crunchy apple slaw. I HIGHLY recommend doubling the slaw recipe because it was so refreshing and we went through the first batch pretty quickly. 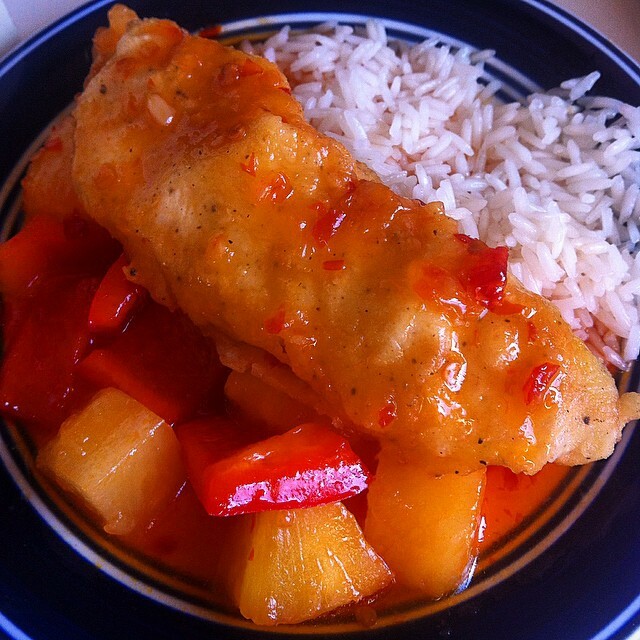 This dish was inspired from two different recipe blogs. The meatballs were adapted from Savory Nothings which is a gorgeous blog with stunning photos and easy to follow recipes. The slaw was adapted from Damn Delicious which is also a beautiful recipe blog (my favorite part of her posts are that she adds the nutritional facts for each recipe). Give both blogs a look if you try and like this recipe their recipes are a tad different from this one and they have tons of other tasty posts. 1 bag of slaw mix (I would recommend getting an extra red cabbage and carrot, chopping/slicing them up, and adding them to the mix. There is never enough red cabbage or carrot in store bought slaw). Preheat your oven to 400 F, also if you are using bamboo/wooden skewers soak them in water for 30 minutes. Combine all of the meatball ingredients in a large bowl until well combined. Form small balls and line them up on a greased baking sheet. Bake the meatballs in the oven for about 10-15 minutes, until no longer pink in the center (I always reserve one meatball as my “tester” to check for pinkness and when cooked to check for taste). Once cooked, set the meatballs aside to cool. While the meatballs are baking and cooling combine all of the sauce ingredients in a saucepan. Cook over medium heat until it begins to lightly boil. Be sure to stir the sauce frequently as it will burn if not tended to. Once boiling turn heat down to a simmer continuing to stir until it is nice and thick. Once thick remove the saucepan from heat. Once meatballs are cooled string 3-4 meatballs on each skewer. Spoon or brush the sauce over the meatballs, coating them really well. Fire up your grill and cook the kebabs until nice scorch marks appear. Plate with your favorite sides (aka the slaw recipe below) and Enjoy! In a large bowl combine the slaw mix and apples. In a separate bowl mix all the “wet” ingredients together until well combined. Pour the saucy mixture over the apples and slaw. Toss until the slaw is nice and coated. Cover and put in the fridge for at least one hour. When ready to serve toss the slaw and plate. 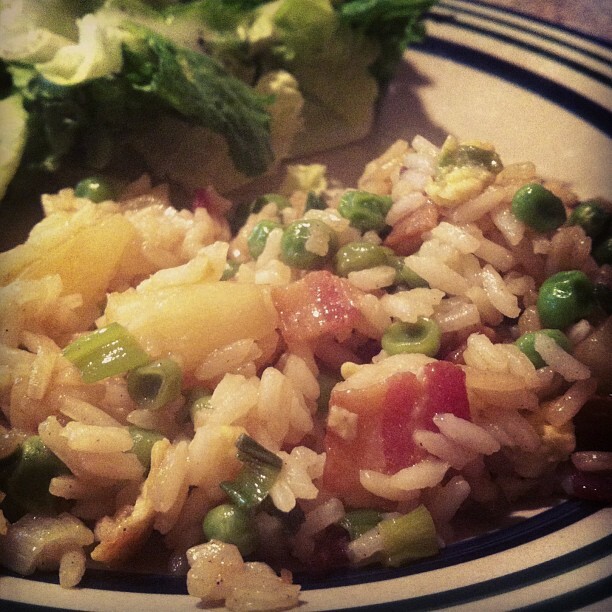 Something Perry has been craving lately is fried rice. We don’t get take out often and hardly ever visit Chinese Restaurants to eat (my almost 3-year-old won’t allow it) so I had to whip something up at home. I’ve never been any good at cooking rice so I had to search for an easy recipe with good ratings. It did not take me long to find this five star recipe, and believe me it is worth all five stars 🙂 I did not use “ham” but instead I used bacon. If you follow my lead I would cut the added salt down by half because the bacon adds a lot of its own salt. Other than that the recipe is super easy, fast and delicious. Heat sesame oil in a large skillet over medium-high heat. Cook and stir the green onions, ham, and peas in the hot oil until onions have softened, about 2 minutes. 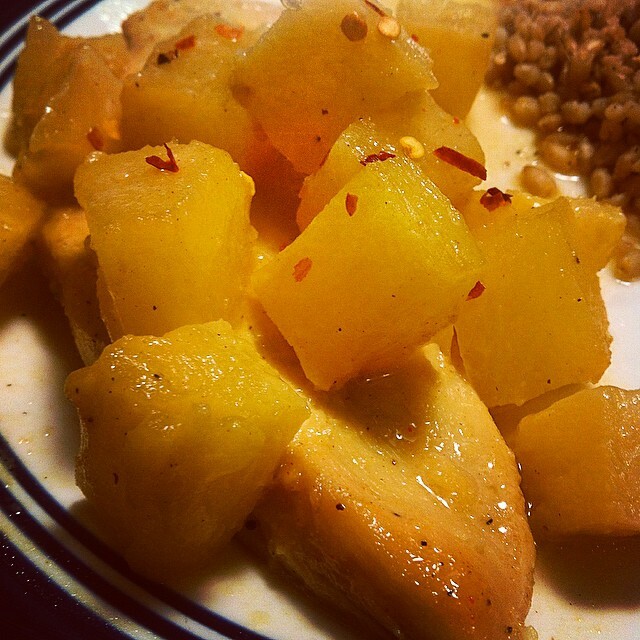 Stir the pineapple chunks into the skillet; cook until pineapple begins to darken, about 2 minute. Push ingredients to the side of the wok, and pour beaten egg in the center. Cook until egg begins to solidify, about 30 seconds. Stir together all contents of the skillet. Mix the cooled rice, sugar, salt, white pepper, and garlic powder into the skillet; stir constantly to keep from sticking. Cook until heated through, about 3 minutes. Sprinkle the rice with the soy sauce, and stir to combine. These babies were just the thing to polish off the beautiful summer day today. 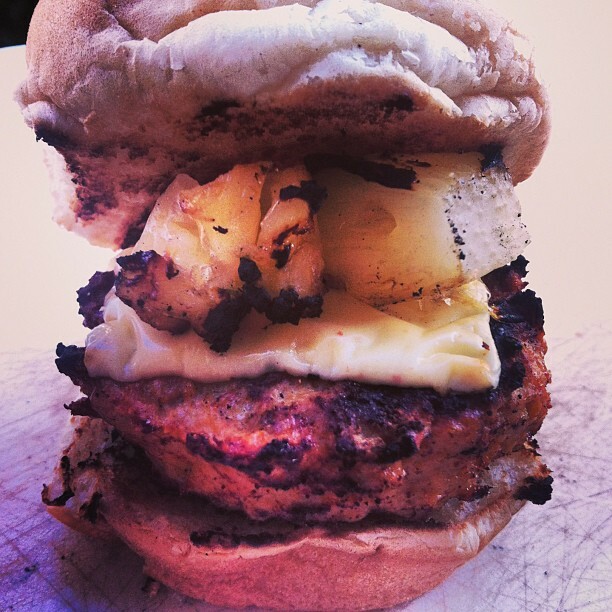 The pineapples and chicken burger patties were juicy, flavorful, and grilled to perfection. The only thing I might add is a tsp of teriyaki sauce. All together these hit the spot. In a large bowl, combine ground chicken, soy sauce, 1/4 tsp paprika, 1/4 tsp chili powder, salt, cumin, and garlic in a large bowl. Mix and divide into 9 large even balls. Keep in mind that the mixture might be a little sticky so don’t expect the balls to be perfectly formed. Just make sure you use close to the same amount of mixture per “ball.” Form patties, making them slightly thinner in the middle. Mix together the remaining 1/4 tsp paprika and 1/4 tsp of chili powder and sprinkle over the patties. Refrigerate the patties for 30 minutes. Do not skip this step because it will be difficult to transfer the patties to the grill. Preheat your grill to medium-high and grease the rack with cooking spray. Cook patties for 2-4 minutes per side or until cooked through. If you are using cheese (which I highly recommend) add it to the patties when you have a minute left on your timer. String pineapple chunks onto skewers and grill for 1-2 minutes or until you begin to see grill marks. Toast your bun if you wish and put together your sliders. I’ve been getting into baking chicken as opposed to pan frying lately. I swear I will never EVER properly cook chicken in a pan. It is always dry and gross when I do so I’m throwing in the towel and sticking to my oven. Between this recipe, the rosemary walnut recipe, and the Moroccan chicken recipe I’m set in the chicken department 🙂 This one is especially good because of the tropical salsa that it’s been paired with. I’ve had this recipe written on an index card for years now and finally decided to give it a go. I’m sad I had not tried it sooner. Crack egg into shallow dish and beat lightly. 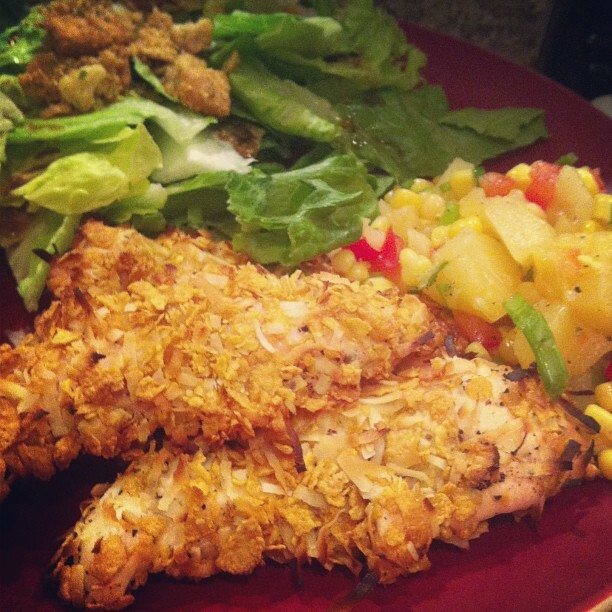 Combine corn flakes and coconut in another shallow dish. Season chicken with salt and pepper. Dip chicken in egg and dredge in corn flake mixture. Toss together pineapple, corn, bell pepper, scallion, lime, oil, salt/pepper in a large bowl. Serve chicken with salsa and enjoy!